PR: Selected by Laptop Magazine as one of the "Innovations that Redefine Mobility," the iCaddy was introduced at the Consumer Electronics Show in Las Vegas to an enthusiastic reception. With the warning last October that the use of laptop computers can cause infertility in men, the iCaddy has become the right product at the right time. On the outside, the iCaddy sports a ultra stylish sculptured shell made out of light weight yet durable ABS type plastic. The top and bottom are finished with a soft feel rubberized material for added luxury and protection. What makes the iCaddy truly unique is its dual function double hinged foam padded lid. When closed, the foam padding secures and protects the computer. When opened, the lid flips all the way under to become a cushioned base as part of an ergonomically correct lap cradle. And, this transformation takes less than 5 seconds without having to remove the computer from the case. The iCaddy can be adjusted to hold any size computer up to a 15.4" screen. The back panel automatically opens up for easy access to the slots and plugs. The side panel can be folded down for access to the drives. Air vents will help keep the computer running cooler. The sculptured handle doubles as a wrist support and a padded shoulder strap is included. Need to carry your other stuff? Then, snap on the optional iCaddy Saddlebag. Price: $25. The iCaddy will be available this summer for about $160. PR: Crescendo/WS G3 500 MHz now 199.95 (was $249.95). The Crescendo/WS G3 500 MHz is compatible with the PowerBook Series 233, 250, 266, 292, 300 MHz (WallStreet). PR: These elegant, palm-sized drives are small enough to fit in your pocket, yet they safely store large amounts of data. You can even password-protect your files (Windows only). 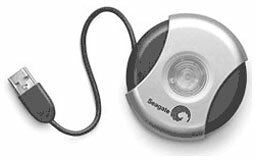 They're also extremely durable, with a sleek round shell that absorbs shocks, so you never have to worry about your data. Powered by your computer, so you don't need a power supply. Hot-pluggable USB 2.0 interface enables data transfer up to 480 Mbps. 3600-RPM drive with 2-Mbyte cache consistently delivers the high performance you need. Worry-free one-year warranty, plus free technical advice even after your warranty ends. Comes complete with built-in, retractable 2.0 cable, quick connect guide and utilities CD. PR: This is a brand new Slot Loading SuperDrive (DVD & CD burner) for the PowerBook G3 Pismo and Lombard. This drive installs into your current DVD drive module and will work as a replacement to a dead drive or an upgrade from a working drive. Installation instructions are included, and the process takes less than 5 minutes! The faceplate on this drive is not identical to the faceplate on your current drive. This bezel is black in color and does match nicely. However it will not have the contoured look of your current bezel. This item does not printed installation instructions. Have a dead drive? Get $20 or a credit on your purchase of a new drive! PR: This is a brand new Slot Loading Combo drive (CD burner) for the PowerBook G3 Pismo and Lombard. PR: MaxProtect is an impact resistant carrying bag for PowerBooks and iBooks that provides maximum shock protection while carrying your computer. MaxProtect is made of Visco-Elastic Memory Foam which exhibits excellent resistance against impact and shock. PR: Look Ma, One Hand! Cavernous main compartment. Tons of oversized pockets. Highly organized. One-handed access to everything. Includes non-slip Shoulder Pad. 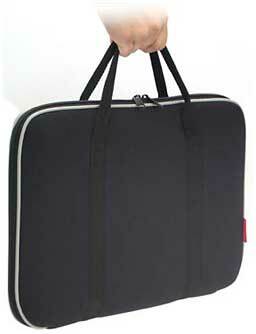 The Cargo Laptop Bag is the biggest, boldest bag we make. Flaps come in eye-catching Indium or distinctive leather. Choice of cool aluminum aircraft buckle or aluminum para-gliding buckle. Large with Indium Flap, $209, with Leather Flap $249 - 16" x 12" x 5" / 4.3 lb. 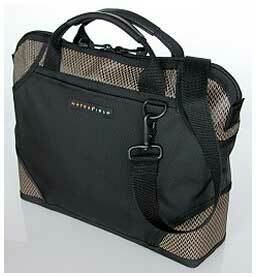 Medium with Indium Flap, $189, with Leather Flap $229 - 16" x 12" x 3" / 2.9 lb. Small with Indium Flap, $169, with Leather Flap $199 - 13" x 10" x 4" / 2.3 lb. PR: Cosmopolitan. Go first class, even if you're just going down the block. 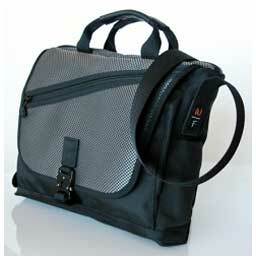 Smart design and smart style includes offset D-rings for auto-balance and "weightless" suspension shoulder strap. Same great shape, empty or full. Large Cozmo, $149 - 16" x 12" x 5" / 2.7 lb. Medium Cozmo, $144 - 15" x 11" x 4.5" / 2.4 lb. Small Cozmo, $139 - 14" x 10" x 4" / 1.9 lb. PR: Too much excessive drain on a vehicle battery can ultimately degrade or ruin it. This problem intensifies when installed mobile equipment such as laptops are left on and not turned off. The Lind T Series Adapter is an ideal 12VDC power adapter to use for laptops that are permanently mounted in fleet or public safety vehicles. The integral timer will shut off power to the laptop within a factory-set time limit after the automobile has been turned off, thus protecting the vehicle battery from excessive voltage drain. Many installations will have a separate protective timer device wired into the voltage circuit to shut off peripherals. If the timer is only needed to shut off power to a laptop, this function as part of the adapter eliminates the need for wiring in a separate timing device. This simple connectivity will save an installer time and money. The rugged design of Lind laptop power adapters make them ideally suited for use in harsh mobile environments. The adapter electronics is protected by an ABS or Aluminum housing which is filled and sealed with epoxy that protects the internal circuits from damage due to shock, vibration and spilled liquids. Efficient power conversion circuits with extensive protection circuitry provide reliable and continuous laptop power conversion in the most demanding military, commercial and public safety environments. Lind is a leading supplier of DC-DC conversion products for a wide range of laptops manufactured by companies including Apple, Dell, Harris, Motion, Motorola, NEC, Panasonic, IBM, HP, Compaq, Toshiba, and many others. Ruggedized construction, multiple protective circuits and optimal mobility make Lind the first choice for reliability. PR: Toshiba Corporation has announced a breakthrough in lithium-ion batteries that makes long recharge times a thing of the past. The company's new battery can recharge 80% of a battery's energy capacity in only one minute - approximately 60 times faster than the typical lithium-ion batteries in wide use today - and combines this fast recharge time with performance-boosting improvements in energy density. Excellent Recharge Performance. 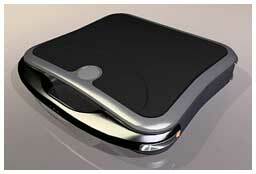 The thin battery recharges to 80% of full capacity in only a minute. Total recharge takes only a few more minutes. High Energy Density. Small and light, the new battery offers a high level of storage efficiency. The prototype battery is only 3.8mm thick, 62mm high and 35mm deep and has a capacity of 600mAh. Long Life Cycle. A prototype of new battery (a laminated lithium ion battery with 600mAh capacity) was discharged and fully recharged 1,000 times at a temperature of 25 degrees centigrade and lost only 1% of capacity during the test. Temperature. The new battery operates well in extremes of temperature. It discharges 80% of its capacity at minus 40 degrees centigrade, against 100% at an ambient temperature of 25 degrees centigrade, and loses only 5% of capacity at temperatures as high as 45 degrees centigrade after 1,000 cycles. These characteristics assure the wide applicability of the battery as a power source for products as diverse as hybrid vehicles and mobile phones. Eco-friendly Battery. The new battery can quickly store energy produced by locomotives and automobiles. This speedy and highly effective recharge characteristic of the battery will support CO2 reduction, as the battery can save and reuse energy that was simply wasted before. There has been quite a bit of discussion lately on the Mac Web about whether Apple will, or should, introduce an iBook mini. We have no idea whether Apple is even considering such a product, but Dell just released a new laptop that is in the size and weight class that an iBook mini, if one ever arrives, would occupy. Dell has introduced its notebook for traveling professionals, the Latitude X1. Starting at 2.5 pounds, the Latitude X1 is designed for mobile users who demand the lightest possible weight without sacrificing performance or durability. In delivering the Latitude X1, "Dell is responding to the demands of our most frequently traveling business customers," said Alex Gruzen, senior vice president of Dell's Product Group. "While lighter than any other Dell notebook, the Latitude X1 combines the latest mobile processors, wide screen displays, optimal for viewing for the multiple windows found in the latest productivity applications, and an outstanding keyboard that focuses on usability." The Latitude X1 is designed and built for the rigors of life on the road and meets the full scope of Dell's quality and reliability testing. 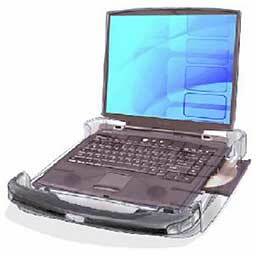 The LCD back is reinforced to counter the pressure of an overstuffed bag placed under seat or in an overhead bin. The keyboard is sealed to protect against spills. The 12.1", wide-aspect display has shorter height than traditional screens and fits easily in tight spaces, including tray tables pinched by fully reclined seats. For the lightest travel weight possible, the Latitude X1 comes with an extremely small power adapter that is almost 50 percent smaller than the typical Latitude power adapter. When configured with the optional six-cell battery ($129), users can expect up to six hours of battery life while adding only 0.3 pound. According to a recent research study by Gartner, Inc. across all countries/markets, the first reason for purchasing mobile PCs (by large businesses) was "increasing number of traveling/field workers." "The new class of ultralight notebooks offers mainstream performance in an impressive form factor that will appeal to business travelers for whom size and weight are the primary decision criteria," said Leslie Fiering, Research Vice President, Gartner, Inc. Starting at $1,699, the Latitude X1 is powered by Intel's Centrino Mobile Technology, featuring the Pentium(R) M Ultra-Low Voltage processor 733 (1.1 GHz). Customers can stay connected with integrated WiFi(TM) 802.11 b/g, Bluetooth 2.0+EDR wireless capability and Gigabit(e) Ethernet. Like other Latitude notebooks, the X1 features the Trusted Platform Module (TPM 1.1) for generating and storing onboard encryption keys. The Latitude X1 comes standard with industry-leading service offerings including three-year limited warranty and, if necessary, Next Business Day Onsite service. Customers can get next business day, on-site service and support in the United States. Additionally, customers traveling overseas can have their systems serviced or repaired abroad with Dell's International Travelers warranty. Latitude X1 From $1,748 to $2,387. PR: According to recent research conducted by Venture Development Corp., mobile device failure frequently is a result of organizations deploying devices that are not suitable or rugged enough for the environments in which they are used. These failures in direct store delivery/route accounting applications, where replacement units are not readily available, can result in as much as $125 in lost revenue per hour. To help keep mobile workers on the road, Intermec Technologies Corp. introduced the company's most rugged mobile computer, the CK60, designed specifically for the physically demanding requirements of the DSD market. The Intermec CK60 is constructed with a magnesium top cover, rubber bumpers on each corner to cushion against drops, and a case that is sealed against water and dust to IP64 standards. It is designed for fast input and retrieval of information with a QVGA touch screen display, enabling it to run both text-based applications and graphical interfaces, and a large, easy-to-use keypad that allows one- and two-handed input of large amounts of data. To avoid loss of data, the Windows CE 5.0-based CK60 has onboard, nonvolatile memory, called Persistent Storage, which preserves applications and databases, even if the battery becomes depleted. The mobile computer also has an SDIO card slot that enables the use of removable storage cards providing more memory for large databases. "The Intermec CK60 takes advantage of the advanced networking and communications technologies in Windows CE 5.0, which dramatically increases data-processing speeds and provides mobile professionals with reliable access to information on the road," said Jane Gilson, director for the Mobile and Embedded Devices Division at Microsoft Corp. "We're pleased to see Intermec basing a new era of rugged mobile computers on Windows CE." The CK60 uses Intermec's SmartSystem, the ADC industry's most comprehensive system for complete device management. With SmartSystem, installation, routine maintenance and application software updates, security adjustments and device settings can be performed automatically and managed remotely, dramatically reducing field downtime and increasing efficiency. "Mobile workers require devices that won't quit on them, no matter what the working conditions," said Intermec Vice President Mike Colwell. "With its rugged construction, long battery life, and Persistent Storage, the CK60 keeps route drivers productive for their entire shift while protecting the valuable data they collect." A variety of connectivity methods are integrated into the CK60, including high-speed Ethernet, USB and RS232 serial connections as well as Bluetooth wireless personal area communications. The CK60 will be available for delivery in Q2.